ABC blocks are one of the most classic toys for tots, but as any parent knows, sometimes its hard to resist piling up these colorful little blocks ourselves! A clever idea from the inner child of Benjamin Rollins Caldwell at BRC designs, the colorful ABC123 Chairs have been constructed with hundreds of colorful alphabet wood blocks into a distinctly modern yet playful piece. This fun and funny chair is a perfect eco-alternative to the shoddy plastic children's furniture that dominate local stores, and are bound to become enduring classics. 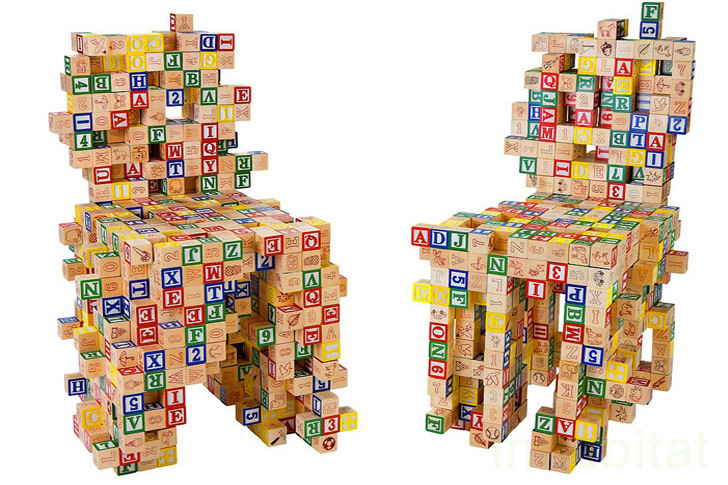 Kid tested and parent approved, the charming ABC123 Chair is sure to inspire your children to stack with imagination! We stumbled across this charming chair at the International Contemporary Furniture this year, and were instantly smitten with its playful aesthetic. Designer Benjamin Rollins Caldwell of BRC Designs has long been fascinating the Inhabitat editorial team with his weird and wacky furniture made from household bric-a-brac, such as coffee tables made from motherboards, and chairs made from playing cards, $1 bills and piano keys. We think he’s come up with a real winner this year in this ABC block chair concept, and we’re hoping he’s able to produce these on a larger scale. I can think of a lot of families with old blocks kicking around who would love a chair like this! While the alphabet blocks grab the attention of youngsters, the definitively modern design is sure to win the hearts of those over 3 feet tall. The ABC123 Collection even includes an amazing desk! Great for adults and kids, you can easily add a little color to any room with just one or two of these chairs. We first spotted these chairs at ICFF in NYC this year, and we were immediately smitten with the design. We can imagine your kids trying to pull this piece apart, but a sturdy construction means this chair is here to stay. Sustainable, striking and family friendly, the ABC123 Chair is one of our favorite kids' furniture picks of the year!